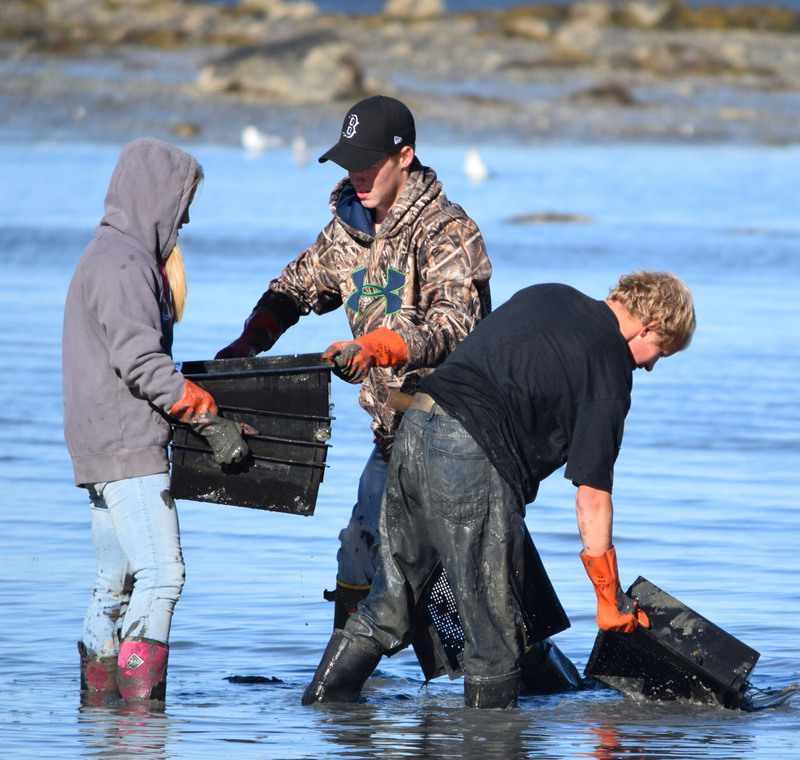 Schoodic Institute uses the word “authentic” in its work with Sumner Memorial High School to describe science learning that addresses real problems and needs, where people outside the school want the data that the students collect. It is also authentic because students learn that work by professional scientists isn’t limited to labs or offices. There is a lot of science that happens outdoors, requires hard work, and sometimes involves getting dirty and, as this picture shows, can require some agility. Below, Department of Marine Resources (DMR) scientist Heidi Leighton is collecting a sample from a research plot in John Small Cove, west of Schieffelin Point in Gouldsboro. The black plastic boxes in front of her are part of the experiment. The conjecture is that the disturbance in seawater flow that the boxes create as tides move in and out will increase the rate of settlement of tiny seed clams (called “spat”). 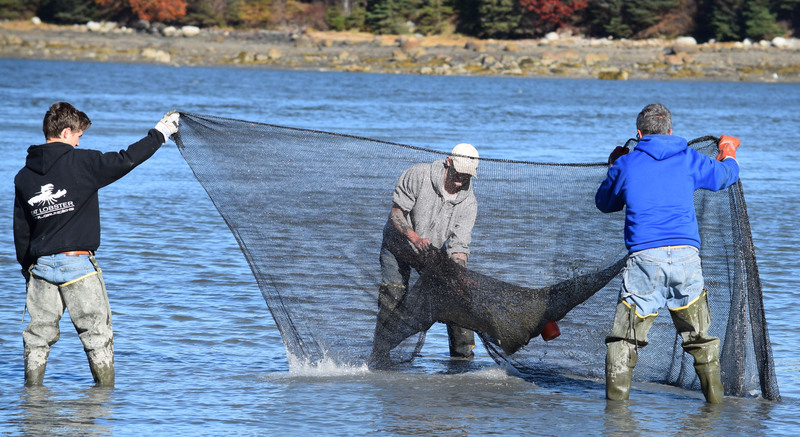 The experiment is part of a larger effort by Gouldsboro and Steuben’s shellfish committees to increase the number of wild clams that settle out of the water to grow on clam flats. The piece of “scientific equipment” that Heidi is using to collect a core sample from the mud is a number 10 can with a hole drilled in the bottom and a cork to seal the hole. She removes the cork, presses the can down into the mud, replaces the cork, and lifts up the core sample. Then, as illustrated in the picture below, she places the entire can into a plastic bag, which is being held by a student in this picture. When she removes the cork, the mud, clams, and whatever else was in the sample drop into the bag. Each plastic bag with a core sample was labelled according to its plot in the experiment. Below is a diagram of the different plots and treatments. Each plot was 12 feet square. Half were covered with a net to protect small clams from crab predation, half were left uncovered. Half contained the plastic boxes intended to improve clam settlement, half did not. Half were higher up along the tidal gradient, half were lower. Plots 1-2 and 2-3, which had neither a net nor boxes, served as control plots, representing the “no treatment” condition. 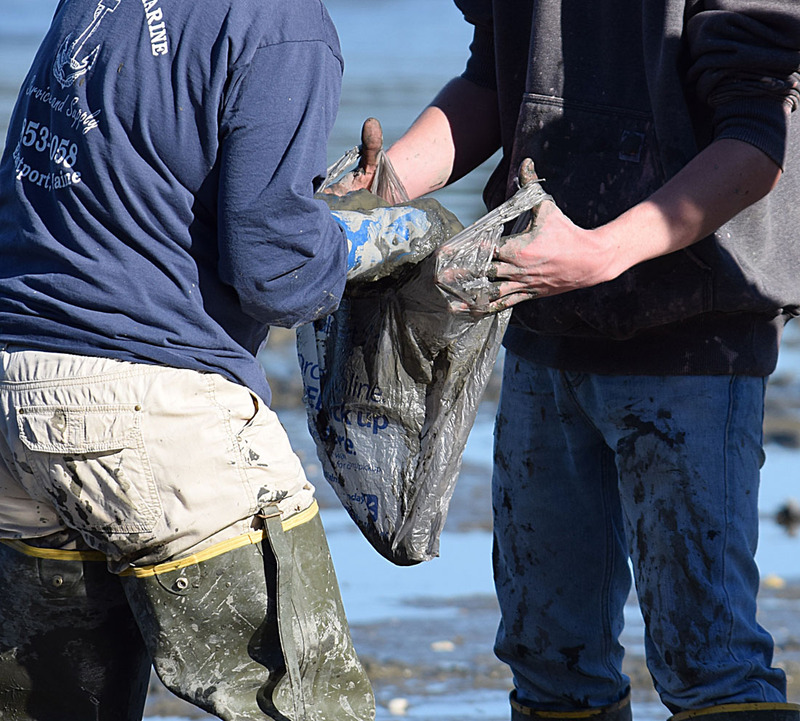 Just a quick look at the plastic boxes was enough to indicate that wild clams actually had settled in the top layer of mud and had started to grow. Later on, once we have washed all the mud of the samples (see my previous post) and counted and measured all the clams, we will find out whether the boxes actually improved clam settlement. 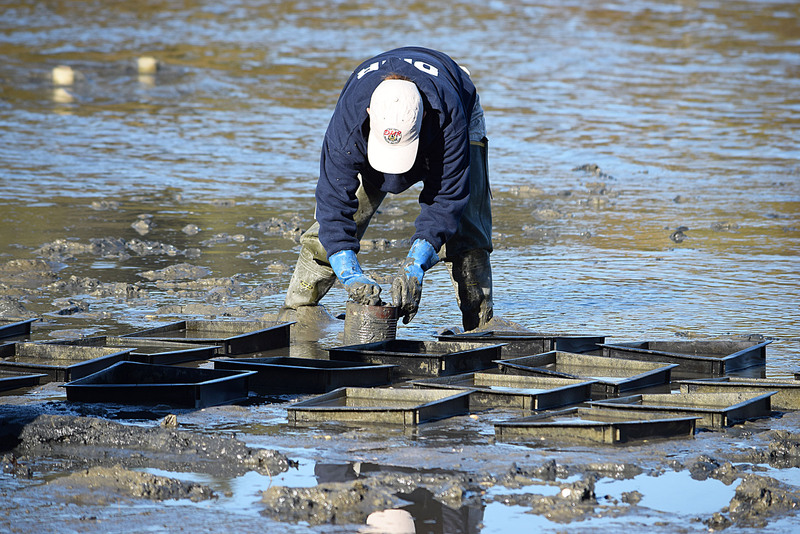 But, in any case, when we retrieved the boxes the newly settled clams needed to be placed back into the mud. As the picture below shows, this involved flipping the boxes over. 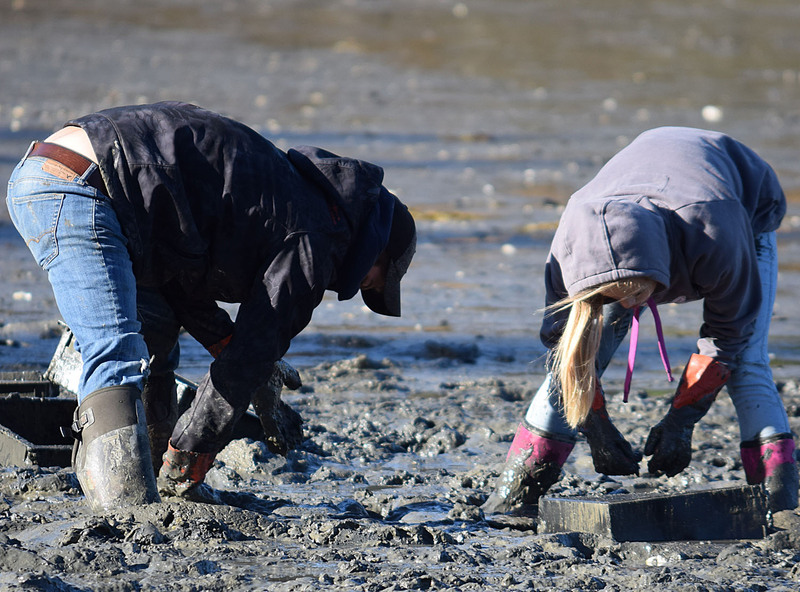 Once the boxes were flipped, the students needed to dig through the resulting “mud pie” so that the newly settled clams, which are still only a few millimeters across, could still extend their tiny siphons up to the surface. Once all the boxes were empty, they had to be washed and stacked. The same was true for the nets that had been used to cover half the plots. The photos below show what that work looks like. The students involved in this project are getting the opportunity to find out that the life of a working scientist can be much different from the kind of activity that students typically encounter in high school science class. Just as important, the students are an essential part of making this study possible, and they are aware of that. We were working very close to the edge of tide on a day when the low tide was about two feet above mean low tide. 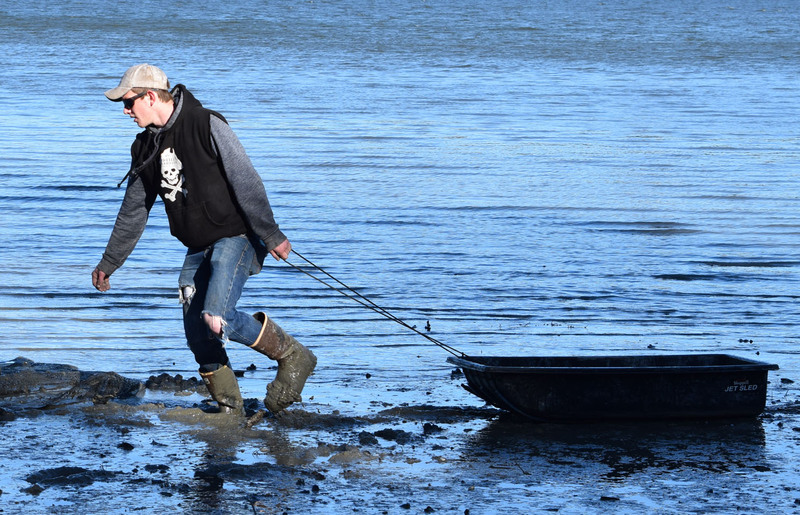 We chose a day with a small tide in order to make washing the nets and boxes easier than it would have been if there had been a couple hundred feet of mud between the study site and the water line. But working right around the tide meant that we did not have a lot of time to do the work. Having done this once before, this crew knows how to watch out for and avoid walking through control plots that are not netted, help collect samples, wash nets, and, in general, look out for what needs to be done. The week after the students helped collect the samples, they sat down with the washed-off samples and used digital calipers under Heidi’s direction to measure and record the size of each clam in each sample. 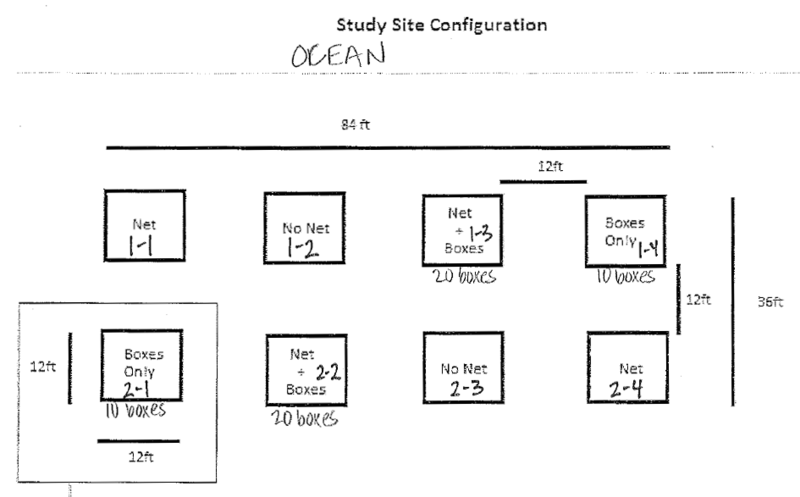 My next post will describe this task of turning samples into data that the students will later use to draw some conclusions about whether placing boxes in the mud affects clam settlement.